Janelle, thanks for visiting. 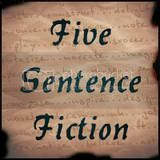 Just prior to beginning “Five Sentence Fiction” I had listened to a series of lectures about constructing longer (unbelievably) sentences, and I have been trying my hand at it ever since. Sounds like this is what it took to get your muse back as well — though mine would’ve been naked. Did I say she was clothed?